The genre of thrash metal has undergone so many facelifts since its inception in the early 1980s that it's hard to keep track of what is or isn't even relative to thrash itself anymore. A great many bands will take it upon themselves to claim their name, but at least fifty percent or more are actually nothing more than nu-metal artists who exude very little (if any) elements of true thrash sound. 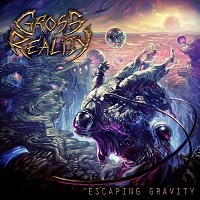 GROSS REALITY have managed to create something new and exciting with their new album entitled "Escaping Gravity", yet those core elements of the thrash sound are ever-apparent throughout. The record opens powerfully with "Dimensional", a song that, once it gets going, instantly takes the listener back to classics of the thrash scene such as TESTAMENT’s "Practice What You Preach" and METALLICA’s "Kill 'Em All". Track two, "Event Horizon", sets the stage for what is to come, exhibiting superior riffing and soaring vocals over a precise and accurate low end that carries it all the way home. But the third track, "Zero Day", is what truly shined for me. With its drilling percussion, chopping guitar work, and emotionally charged vocals, this song harkens back to a day long gone when thrash was at its peak. If only there could be more out there like "Escaping Gravity", then my constant craving for inventive and original metal could be satiated. "Escaping Gravity" chugs along with crusher after crusher, keeping one's head banging all the way. Everything that is good about thrash metal is present, and played in a way so as not to merely copy what has been done before, but rather expand on it and make it something different, which is a quality that is sadly under-utilized in this day and age. I cannot stress enough how important it is to explore what the underground has to offer, lest you miss out on something special like GROSS REALITY, whose talent and musical competency sadly can become overshadowed by big name labels or bands with images and gimmicks designed to obscure the fact that the music just isn't there. This band's image is their sound, which is the way it should be. Overall, "Escaping Gravity" is quite the engaging listen, showing us that thrash is still alive, and that it has limitless potential as a genre. A very progressive album that I found nearly impossible to set down until the final and title track came to a close. I can only hope that we see a lot more from these guys, and that they get the mass appreciation they deserve for their creativity and their ability to sculpt what is ultimately a new and infectious style that burrows under the skin, creating a permanent home within your very being.